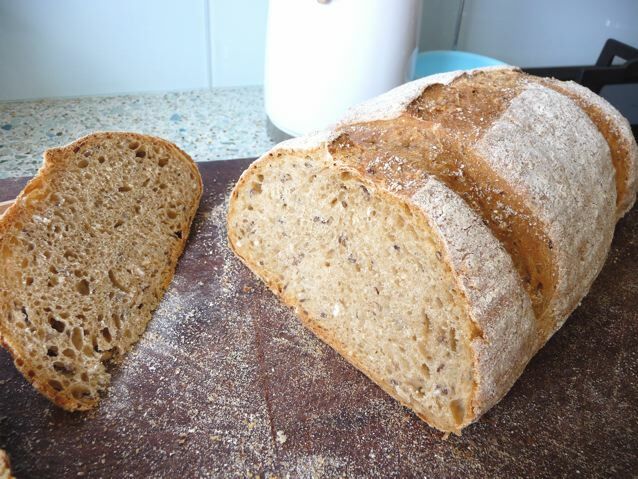 I made a loaf yesterday using Doves barleycorn flour which I had bought out of curiosity. I would quite like to buy all the bread mixes available on the shelves of my local supermarket and try them just to see what they are like, but I resist usually. The finished loaf tasted slightly malty and was quite soft, and for my taste a bit boring and bland, I think I will add some whey or yoghurt to it when I use up the other half of the bag and maybe make rolls with it. I don’t think I would buy it again as I prefer to mix my own flours and seeds. 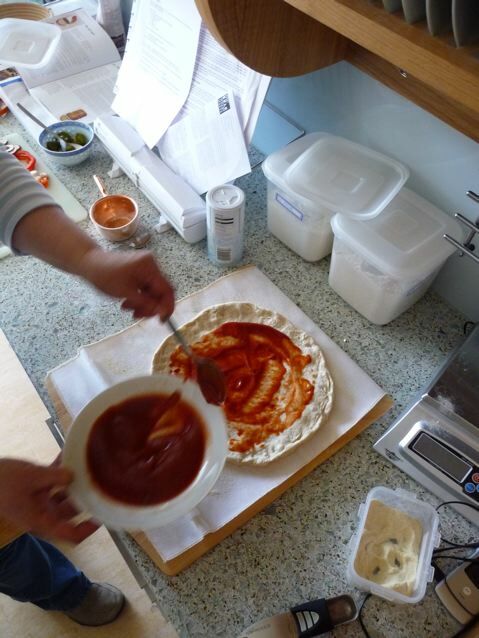 I also prefer it when the grains and seeds have been soaked before mixing into the dough. Here as the flakes and linseed are already in the flour you don’t have the opportunity to do that and when you slice the bread you can see the little dry bits of cut grain or flakes or whatever it is. I’ve just been back to read the list of ingredients. No idea what the last line means. Does it mean there is Ascorbic Acid (Vit C) plus something else? The mouth feel is definitely soft, like it has a fair bit of malt flour in it. Reminds me of a shop loaf somehow even with a white leaven starter. Not a bad shop loaf, but still a shop loaf. Made up for it with a bubbly long retarded sourdough pizza light on the toppings and cheese which we were very pleased with! 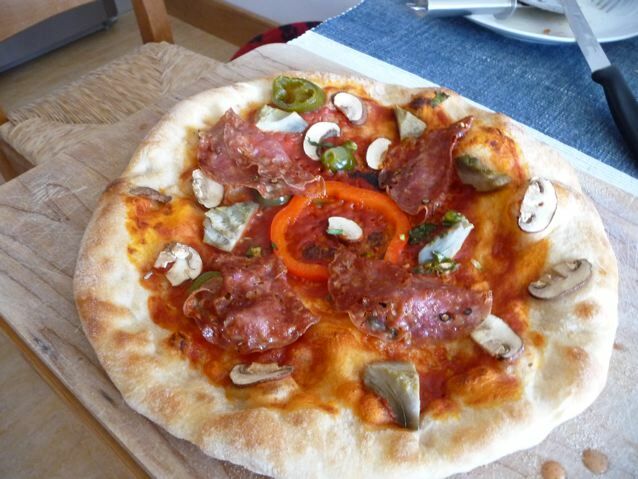 Fresh artichoke, italian fennel salami, jalapenos, mushrooms and a little buffalo mozarella – Pizza light! In case you are wondering what the pizza is sitting on – it’s a super peel! 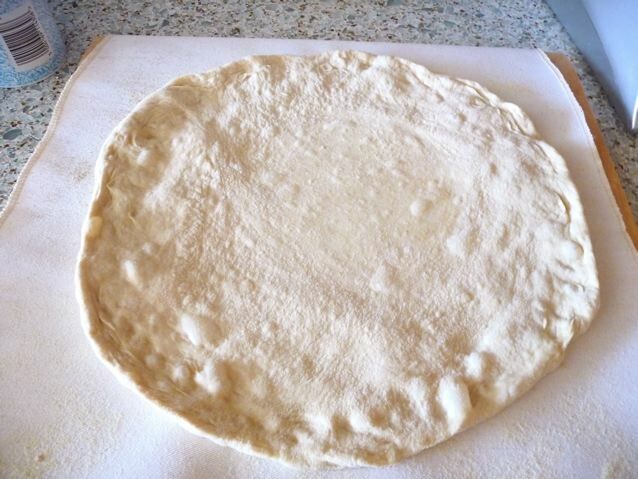 This entry was posted in Bread and tagged baking, Bread, Doves barleycorn, pizza, super peel on 25/04/2010 by Joanna. The loaf looks really lovely, disappointing you weren’t as pleased with the taste. I hadn’t thought about soaking the grains before making bread with them, but probably should have done considering the oat bread of Dan’s that I’ve just made! I would read the ingredients list as being; all ingredients marked * are organic, and then the ascorbic acid (vit C) is non organic, but a permitted ingredient. I think the + is just there to show that the non organic ascorbic acid is there in addition to the other organic ingredients. That would be my take. C I think you are right! I am sure it is possible to get more flavour in the bread from this flour, I just didn’t manage it this time round!